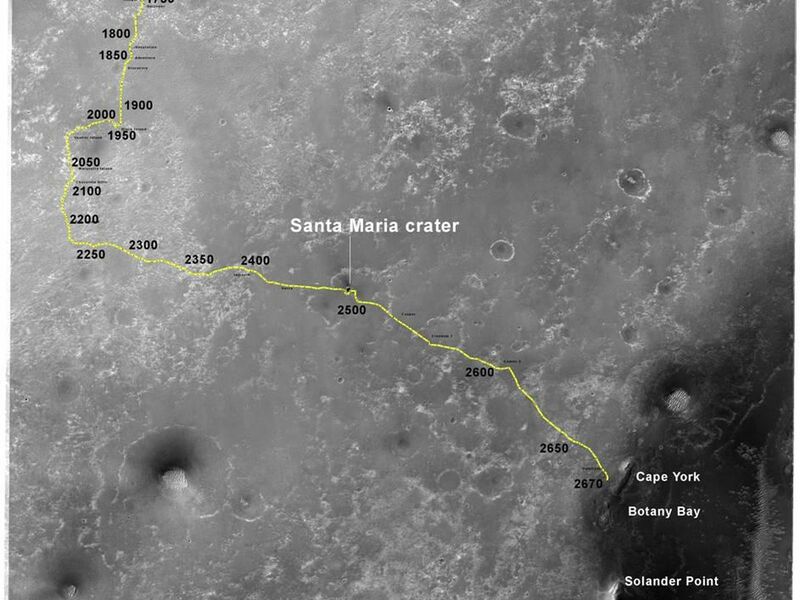 The yellow line on this map shows where NASA's Mars Rover Opportunity has driven from the place where it landed in January 2004 -- inside Eagle crater, at the upper left end of the track -- to a point approaching the rim of Endeavour crater. 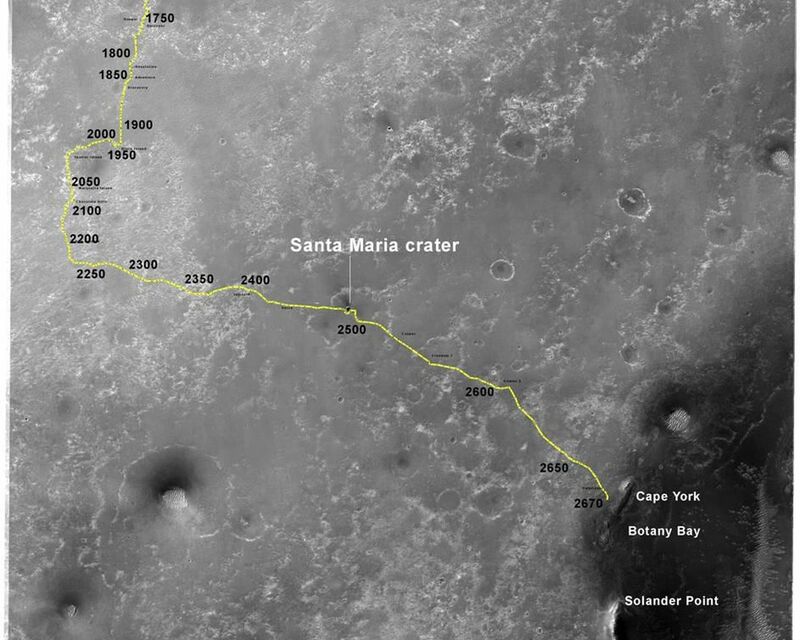 The map traces the route through the 2,670th Martian day, or sol, of Opportunity's work on Mars (July 29, 2011). Endeavour crater has been the rover team's destination for Opportunity since the rover finished exploring Victoria crater in August 2008. Endeavour, with a diameter of about 14 miles (22 kilometers), offers access to older geological deposits than any Opportunity has seen before. In honor of Opportunity's rover twin, the team has chosen "Spirit Point" as the informal name for the site on Endeavour's rim targeted for Opportunity's arrival at Endeavour. Spirit Point is the southern edge of a ridge called "Cape York." 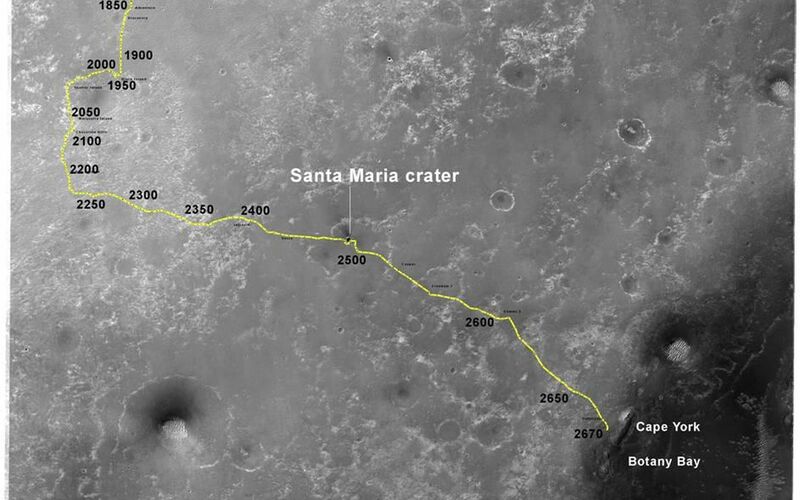 Farther south on the rim, a ridge called "Cape Tribulation" offers exposures identified from orbit as clay minerals. The base map is a mosaic of images from the Context Camera on NASA's Mars Reconnaissance Orbiter. It is used by rover team member Larry Crumpler of the New Mexico Museum of Natural History and Science, Albuquerque, for showing the regional context of Opportunity's traverse. Opportunity and Spirit completed their three-month prime missions in April 2004 and continued operations in bonus extended missions. The Mars Reconnaissance Orbiter reached Mars in 2006, completed its prime mission in 2010, and is also working in an extended mission. NASA's Jet Propulsion Laboratory, a division of the California Institute of Technology in Pasadena, manages the Mars Exploration Rover Project and the Mars Reconnaissance Orbiter for the NASA Science Mission Directorate, Washington. Malin Space Science Systems, San Diego, built and operates the orbiter's Context Camera.